هادیلو, سعید, میرزائی, سعید, هاشمی, حسین, سفیداری, ابراهیم. (1397). معرفی کاربرد نرم‌افزار SeisART برای تحلیل رخساره‌های لرزه‌ای با استفاده از ترکیب روش‌های هوشمند و دانش مفسر. 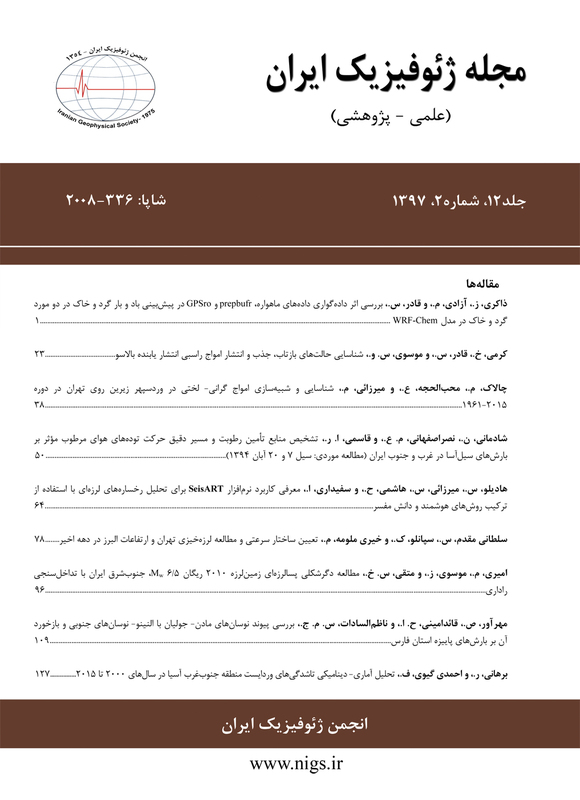 مجله ژئوفیزیک ایران, 12(2), 64-77. سعید هادیلو; سعید میرزائی; حسین هاشمی; ابراهیم سفیداری. "معرفی کاربرد نرم‌افزار SeisART برای تحلیل رخساره‌های لرزه‌ای با استفاده از ترکیب روش‌های هوشمند و دانش مفسر". مجله ژئوفیزیک ایران, 12, 2, 1397, 64-77. هادیلو, سعید, میرزائی, سعید, هاشمی, حسین, سفیداری, ابراهیم. (1397). 'معرفی کاربرد نرم‌افزار SeisART برای تحلیل رخساره‌های لرزه‌ای با استفاده از ترکیب روش‌های هوشمند و دانش مفسر', مجله ژئوفیزیک ایران, 12(2), pp. 64-77. هادیلو, سعید, میرزائی, سعید, هاشمی, حسین, سفیداری, ابراهیم. معرفی کاربرد نرم‌افزار SeisART برای تحلیل رخساره‌های لرزه‌ای با استفاده از ترکیب روش‌های هوشمند و دانش مفسر. مجله ژئوفیزیک ایران, 1397; 12(2): 64-77. تحلیل رخساره‌های لرزه‌ای، فنی است برای به نقشه درآوردن خصوصیات و ویژگی‌های زمین‌شناسی با استفاده از اطلاعات لرزه‌ای. برای تحلیل رخساره‌های لرزه‌ای با استفاده از الگوریتم‌های یادگیری ماشین، نشانگرهای لرزه‌ای دسته‌بندی می‌شوند. این دسته‌بندی به شناسایی رخساره‌های مختلف درون مقاطع یا افق‌های لرزه‌ای می‌انجامد.. به دلیل ماهیت داده‌های لرزه‌ای، که همواره درجه‌ای از عدم قطعیت دارند، تنوع نشانگر‌های لرزه‌ای و الگوریتم‌های یادگیری ماشین می‌تواند در تحلیل رخساره‌های لرزه‌ای نتایج مختلفی ایجاد کند؛ به همین دلیل نیاز است مراحل مختلف تحلیل مانند انتخاب پارامترهای ورودی و الگوریتم‌های یادگیری ماشین، با دقت زیاد و با توجه به هدف تحلیل رخساره انتخاب شوند تا درنهایت، بتوان نقشه رخساره‌ لرزه‌ای مناسبی تولید کرد. در این مطالعه، برای پیدا کردن مسیر بهینه تولید نقشه رخساره ‌لرزه‌ای، روشی تعاملی با‌ نظارت مفسر و با استفاده از نرم‌افزار بومی SeisART پیشنهاد می‌شود. در این روش،در روند اجرای تحلیل رخساره، پارامتر‌هایی مانند نوع نشانگرهای ورودی، تعداد خوشه، الگوریتم خوشه‌بندی و دسته‌بندی به‌صورت بهینه برای هدف موردنظر انتخاب می‌شوند و مفسر در یک روند بازگشتی و چرخشی می‌تواند نتایج تحلیل را با توجه به تغییر پارامترهای ورودی مقایسه کند، با در نظر گرفتن نتایج دانش بیشتری از رخساره‌های موجود به‌دست‌آورد و درنهایت، تحلیل رخساره مناسبی ارائه دهد.. ازآنجاکه‌ در این روش، الگوریتم‌های مختلف با پارامترهای ورودی مختلف بر اطلاعات لرزه‌ای موجود اعمال می‌شوند و مفسر می‌تواند با توجه به کارایی هرکدام از پارامترها و روش‌ها، برای اعمال کردن یا نکردن آن تصمیم‌گیری کند، استفاده کردن از این الگوریتم پیشنهادی، این امکان‌ را ایجاد می‌کند که رخساره‌های مختلف موجود در اطلاعات شناسایی شوند و ارتباط آنها با یکدیگر معین شود. روش پیشنهادی برای شناسایی رخساره‌های موجود در افق MSF4 از داده‌های لرزه‌ای سه‌بعدی F3 دریای شمال، آزموده شده است. The analysis of seismic facies is a technique for mapping geological features and properties using seismic data. To analyze seismic facies, seismic attributes are categorized and classified using machine learning algorithms to identify different seismic facies. Seismic facies analysis due to the nature of seismic data, which always has a degree of uncertainty, can produce different results with even small changes in input parameters of the analyzing method. For this reason, it is necessary to select the different stages of analysis, including the selection of input parameters and algorithm of machine learning, with high accuracy with regard to the objective of the seismic facies analysis. In this study, an interactive method with the supervision of interpreter is proposed for producing seismic facies map, using the optimal selection of the input parameters and the the proper selection of clustering and classification algorithms. In this method, the interpreter in a recursive and rotational process can compare the results of the analysis and generate thr optimal results by changing the input parameters. The method presented in this article is implemented in SeisART software. SeisART has a complete environment for data initialization (importing seismic data and well data). A user-friendly interactive environment allows the user to implement several methods and monitor the corresponding result in 2D and 3D. SeisART software makes the possibility of the interpreter contribution in the whole stages of seismic facies analysis procedure. The interpreter can select the input attributes and chose the proper methods of pattern recognition to reach the best possible result. In the software, various evaluation utilities have been provided in each stage of seismic facies analysis. These utilities allow the interpreter to monitor the results of each method quantitatively and qualitatively. In the unsupervised system, clustering quality factors are used. The interpreter calculates the validation indices for different methods of clustering and identifies the proper method which has been more successful in discovering the natural grouping of patterns in the data set. Afterward, if there is structural geology information about the horizon of interest, the interpreter can decide on the clustering result with more accuracy. In the supervised system, the most proper method is feasible using minimization of training data and validation data errors. In this case, the interpreter can use geological knowledge and well data information to verify obtained results. In this method, the interpreter can obtain different results by changing the input parameters. Comparing these results, and taking into account the path leading to this result, the interpreter gains more knowledge of existing facies. This method has been applied to the MSF4 horizons of the 3D seismic data of the North Sea F3 and has been shown which method is more efficient for different purposes. Balasko, B., Abonyi, J., and Feil, B., 2005, Fuzzy clustering and data analysis toolbox: Department of Process Engineering, University of Veszprem, Veszprem. Barnes, A. E., 2006, Too many seismic attributes: CSEG Recorder, 31(3), 40-45. Barnes, A. E., 2007, Redundant and useless seismic attributes: Geophysics, 72(3), 33-38. Barnes, A. E., and Laughlin, K. J., 2002, Investigation of methods for unsupervised classification of seismic data: 72th Annual International Meeting, SEG, Extended Abstracts, Salt Lake City, Utah, 2221-2224. Coléou, T., Poupon, M., and Azbel, K., 2003, Unsupervised seismic facies classification: A review and comparison of techniques and implementation: The Leading Edge, 22(10), 942-953. Chopra, S., and Marfurt, K. J., 2005, Seismic attributes—A historical perspective: Geophysics, 70(5), 3SO-28SO. Davies, D. L., and Bouldin, D. W., 1979, A cluster separation measure: IEEE transactions on pattern analysis and machine intelligence, 2, 224-227. De Matos, M. C., Osorio, P. L., and Johann, P. R., 2006, Unsupervised seismic facies analysis using wavelet transform and self-organizing maps: Geophysics, 72(1), P9-P21. Dorrington, K. P., and Link, C. A., 2004, Genetic-algorithm/neural-network approach to seismic attribute selection for well-log prediction: Geophysics, 69(1), 212-221. Dumay, J., and Fournier, F., 1988, Multivariate statistical analyses applied to seismic facies recognition: Geophysics, 53(9), 1151-1159. Dunn, J. C., 1974, Well-separated clusters and optimal fuzzy partitions: Journal of Cybernetics, 4(1), pp.95-104. Figueiredo, A. M., Silva, P. M., Gattass, M., Silva, F. B., and Milidiú, R.L., 2014, A seismic faces analysis approach to map 3D seismic horizons: SEG Technical Program Expanded Abstracts, 1501-1505. Guillen, P., Larrazabal, G., González, G., Boumber, D., and Vilalta, R., 2015, Supervised learning to detect salt body: SEG Technical Program Extended Abstracts, 1826-1829. Hashemi, H., 2010, Logical considerations in applying pattern recognition techniques on seismic data: Precise ruling, realistic solutions. Cseg Recorder, 35(4), 47-50. Hu, X., and Xu, L., 2003, A comparative study of several cluster number selection criteria: In International Conference on Intelligent Data Engineering and Automated Learning, 195-202. Jang, J. S., 1993, ANFIS: adaptive-network-based fuzzy inference system: IEEE transactions on systems, man, and cybernetics, 23(3), 665-685. Jayaram, V., Avseth, P. A., Azbel, K., Coléou, T., Devegowda, D., de Groot, P., and Poupon, M., 2015, Introduction to special section: Pattern recognition and machine learning: Interpretation, 3(4), SAEi-SAEii. Li, Y., Chen, M., Gao, W., and Zhong, G., 2014, Seismic attributes blending and borehole image facies analysis for reservoir prediction: Case study for a sand-conglomerate reservoir in Pinghu oil field, East China sea basin: SEG Annual Meeting, 2631-2635. Li, X., Chen, Q., Wu, C., Liu, H., and Fang, Y., 2016, Application of multi-seismic attributes analysis in the study of distributary channels: Marine and Petroleum Geology, 75, 192-202. Nikravesh, M., and Aminzadeh, F., 2001, Past, present and future intelligent reservoir characterization trends: Journal of Petroleum Science and Engineering, 31(2), 67-79. Orozco-del-Castillo, M. G., Ortiz-Alemán, C., Urrutia-Fucugauchi, J., and Rodríguez-Castellanos, A., 2011, Fuzzy logic and image processing techniques for the interpretation of seismic data: Journal of Geophysics and Engineering, 8(2), 185. Ross, T. J., 2009, Fuzzy Logic with Engineering Applications, John Wiley & Sons Inc.
Roweis, S. T., and Saul, L. K., 2000, Nonlinear dimensionality reduction by locally linear embedding: Science, 290(5500), 2323-2326. Roy, A., Jayaram, V., and Marfurt, K.J., 2013, Active learning algorithms in seismic facies classification: SEG Technical Program, Extended Abstracts, 1467-1471. Thenin, D., and Larson, R., 2013, Quantitative seismic interpretation—An earth modeling perspective: CSEG Recorder, 38, 30-35. Wang, W., and Zhang, Y., 2007, On fuzzy cluster validity indices: Fuzzy sets and systems, 158(19), 2095-2117. Zhao, T., Jayaram, V., Roy, R., and Marfurt, K. J., 2015, A comparison of classification techniques for seismic facies recognition: Interpretation, 3, SAE29-SAE58. Zhao, T., and Ramachandran, K., 2013, Performance evaluation of complex neural networks in reservoir characterization: Applied to Boonsville 3-D seismic data: In 2013 SEG Annual Meeting, 2621-2625.